Pastels for Fall? Yes, please! 2 Comments on Pastels for Fall? Yes, please! The element of surprise this fall season was definitely pastels. Pastels are better known to be the epitome color of spring; however, many designers such as Miu Miu, Just Cavalli, Nina Ricci, Gucci and many others, had different hues of pastel making a splash here and there on their runway shows. Of course, I had to take a stab at it and so here it is! French Rags Sweater//purchased at Goodwill. 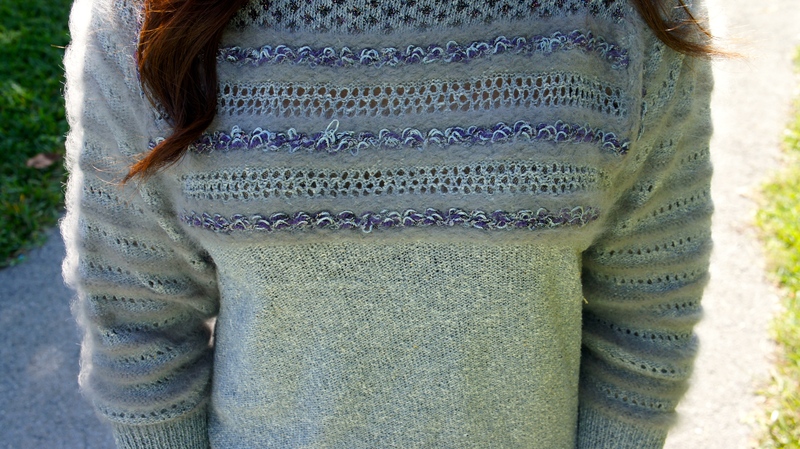 Sweater details, look at those fuzzy sleeves. Next Entry Mustard + Oxblood = So Cool & Oh, So Fall.